It has a certain charm that only German finishings and a subtle diesel growl can deliver. 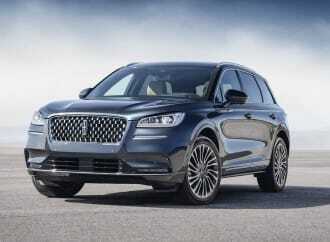 Having grown up in the 1990s, I lived through the golden ages of the SUV. 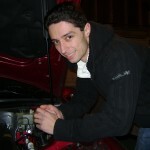 This was before all the car-like fuel saving crossovers came along. Back then there were only a handful of realistic choices; if you wanted something that wasn’t a minivan to haul the family around, you bought either an Explorer, Cherokee, Blazer, or maybe a 4Runner. They guzzled gas and flipped over if you maneuvered to avoid a collision; it didn’t matter though, they were cool. My parents had one of the now quite rare Cherokee-based Wagoneers. It was terribly unreliable and the body rotted out long before I ever got to drive it, but it had a certain charm that today’s friendly looking asphalt-loving CUVs just don’t have. There may be a plethora of choice out there today, but if you want a “real” SUV your choices are still few and far between. 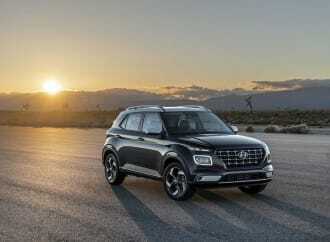 With that in mind I approached my week with the new 2015 Volkswagen Touareg TDI, in top Execline trim, thinking I’d be spending my time with another forgettable family hauler. Boy, was I wrong! 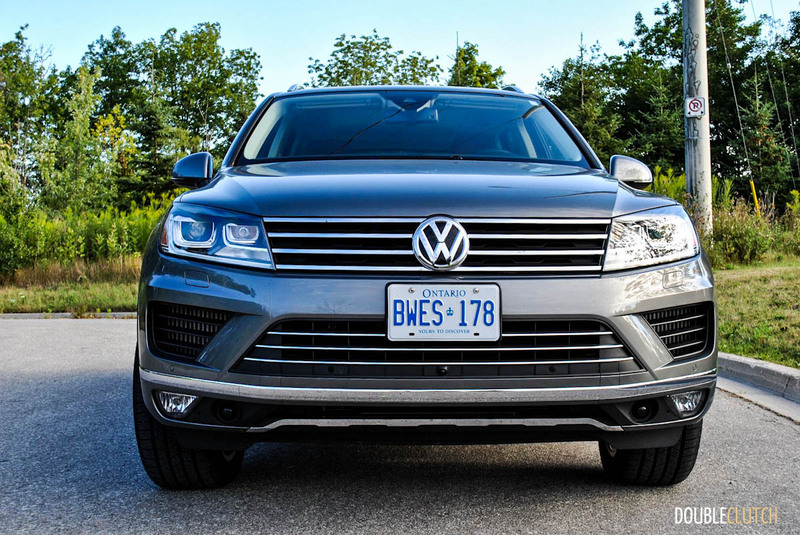 The Touareg holds true to the original notion of a go-anywhere, do-anything SUV with a practical modern spin and I quickly fell in love with it. 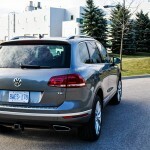 The first thing I like about the Touareg is its brutish good looks. 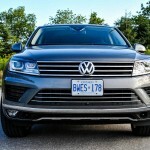 The Touareg doesn’t pretend to be anything it isn’t. 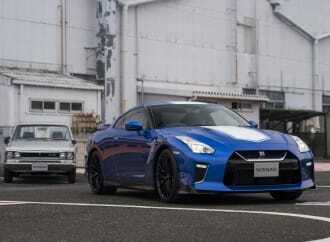 It’s tall, has plenty of ground clearance, great visibility and its lines all flow very well together. 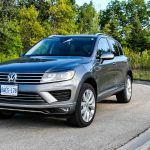 There’s no mistaking the Touareg for anything but a Volkswagen, but its size and style clearly distinguish it from the rest of VW’s very cohesive line up. In Canyon Grey metallic and riding on the 20” Masafi rims standard on the Execline, my tester has a subtle but stately look to it- something I’d compare to a modern take on my parents old Wagoneer. 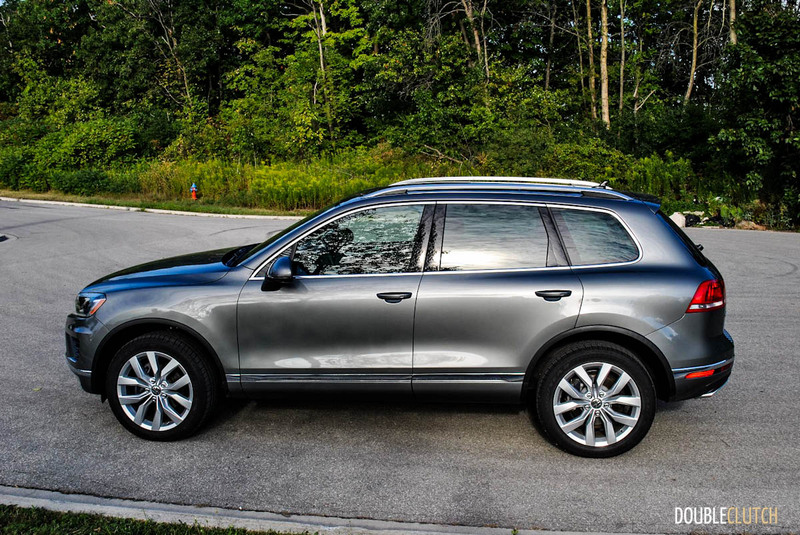 With a starting price of nearly $50,000, the Touareg is far from cheap. 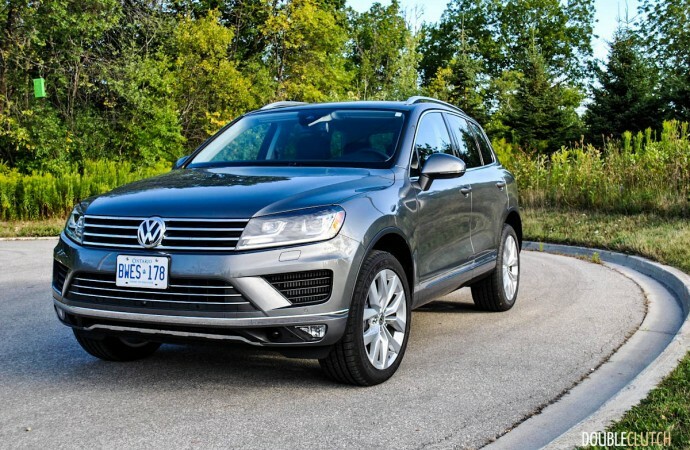 While its price may put it out of reach for families looking for more basic transportation, it does mean that the Touareg isn’t built to a price point. 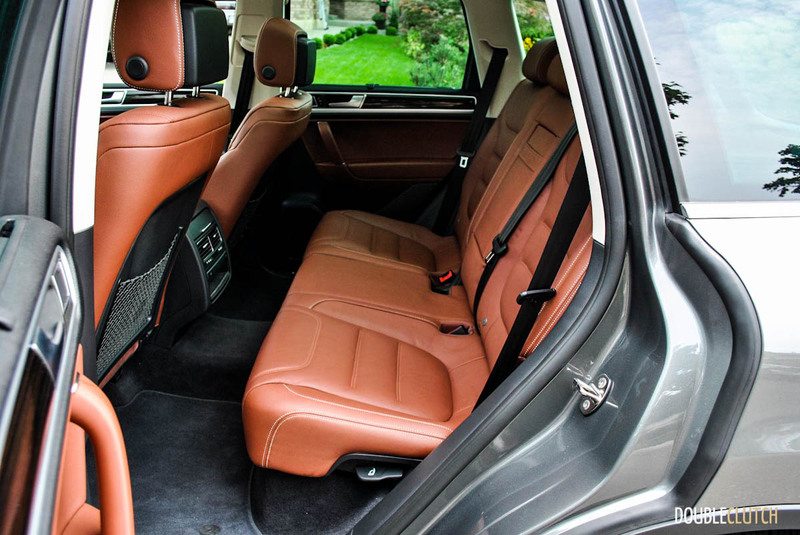 When sitting inside the Touareg, it’s immediately apparent that resources have been allocated towards making the cabin an exceptionally comfortable and luxurious place to be. 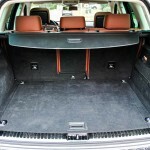 The Terracotta Brown leather in my tester is silky smooth and every other surface in the Touareg is finished to an equally high standard. The aluminum trim is not just some tacked on aluminum; it’s detailed and integrated into the space. 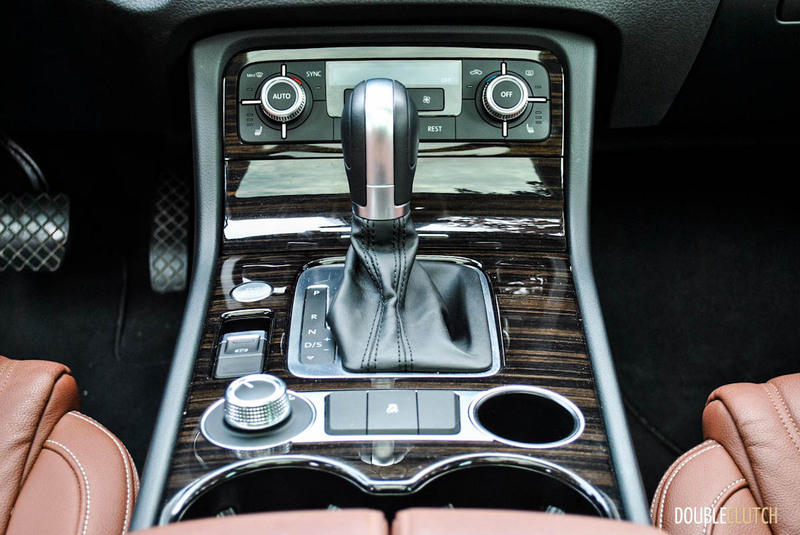 There’s also plenty of high-gloss real wood trim- a once popular trend that’s almost disappeared and is now typically reserved only for the most expensive luxury cars. For what it’s worth, I still love the glossy wood look and I think it really sets off the interior in this SUV. 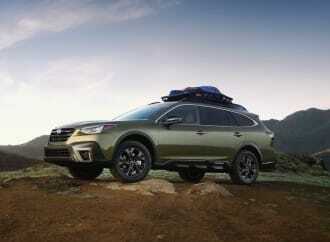 The interior isn’t just beautiful but also functional with versatile rear seating, a huge cargo area with convenient tie down hooks, and clear, easy to understand controls up front. At $68,500, my loaded tester came with the full gamut of luxury options including a panoramic glass roof, air conditioned front seats, heated seats all the way around, heated steering wheel, adaptive cruise control, 360 aerial view cameras and an impressive 620-Watt Dynaudio 12 speaker sound system. 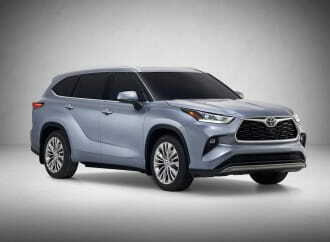 Many of these features are integrated into the touchscreen infotainment system that includes navigation and Bluetooth capabilities. The system is extremely simple to use and understand; even a non-tech friendly guy like me had no problem taking full advantage of the systems capabilities. 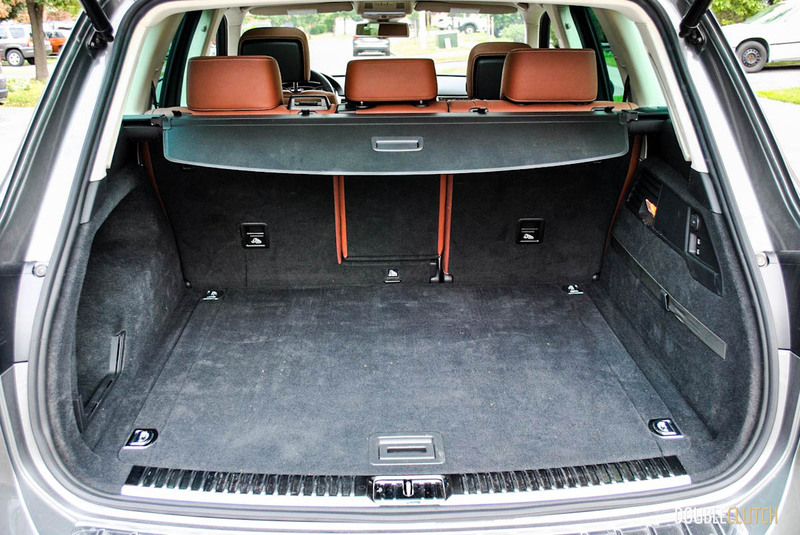 Short of rear entertainment for the kiddies, the Touareg Execline has everything you could ever want to remain comfortable no matter how long the trip. The Touareg is handsome inside and out and loaded with all the great toys; its best part however remains the available 3.0 V6 TDI powerplant. 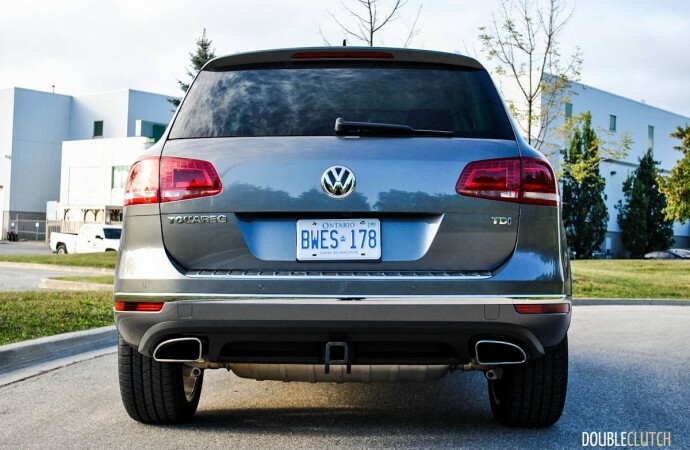 I have to admit I was a little skeptical when looking at the 240 rated horsepower number, but the TDI’s 406 lb-ft of torque makes an appearance at a relatively low 1750-2750 rpm and more than makes up for the perceived lack of horsepower. The TDI’s power delivery is phenomenal; from a standstill it takes a second or so for the turbo to do its thing, but once it’s spooled up it’ll toss you back into your seat like an overzealous lap dancer. 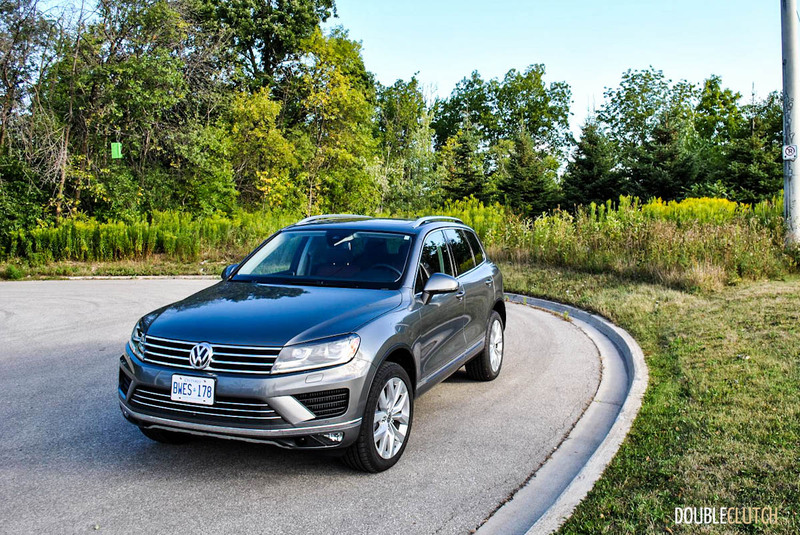 Better yet, rolling along at speed on the highway, the ZF-sourced eight-speed automatic keeps the rpms right near the bottom of the TDI’s torque curve. Stepping on the pedal to pass slower traffic delivers an instant burst of power that’s enough to keep any power addict happy. 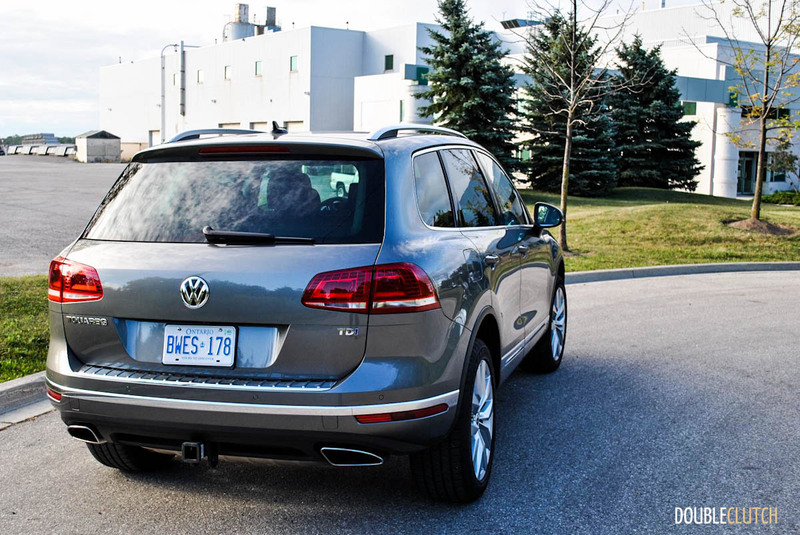 If you’re strong willed enough to refrain from partaking in the TDI’s massive torque too often, it’s very possible to achieve stellar fuel economy numbers, proving that real SUVs don’t have to be inefficient. Throughout my week of rush hour commuting, I saw an average of 8.3L/100kms when using a relatively light foot, and on a road trip out of town I saw averages in the low 7’s! To help put that into context, these numbers are on-par with what I typically expect from a 4-cylinder mid-sized sedan with front wheel drive, which will strain to haul 4 people and their luggage. 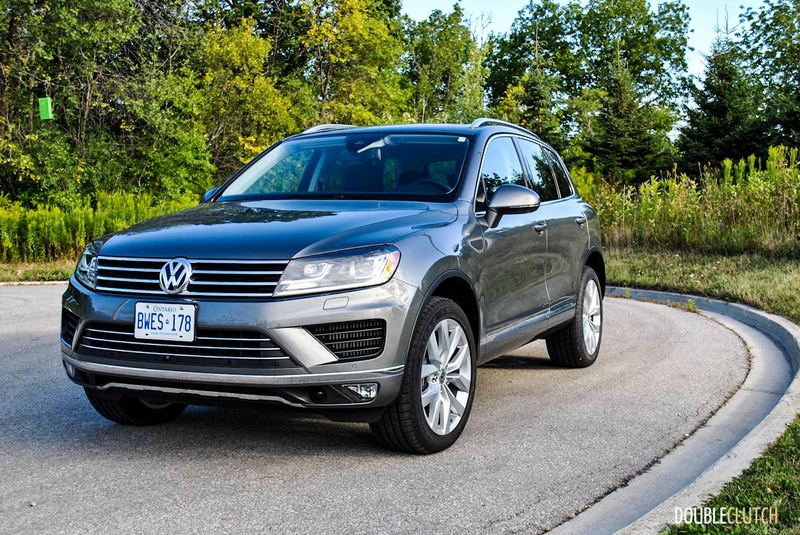 The Touareg TDI with its four-wheel-drive and 7700-lb tow rating will haul all those people, their stuff and a loaded car trailer without breaking a sweat. 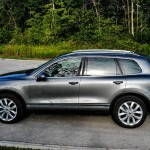 This 3.0L TDI truly lives up to its namesake, and it’s made a believer out of me. 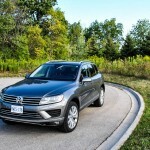 If you are going to drive the Touareg gently, it is a very pleasant experience. The suspension is tuned just right to my tastes- it’s firm enough to inspire confidence and control at high speeds but soft enough to absorb all but the worst low speed bumps. The steering is precise and offers enough road feel to remind you that you’re in control, but while cruising along in a straight line only minimal input is required. It goes without saying for some but if anyone out there still thinks diesels are loud, noisy and stinky, you couldn’t be more wrong. 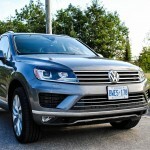 I drove around all week and none of my passengers even realized that the charming Touareg was a diesel. My only indication was a soft growl on startup and my savings at the pump. 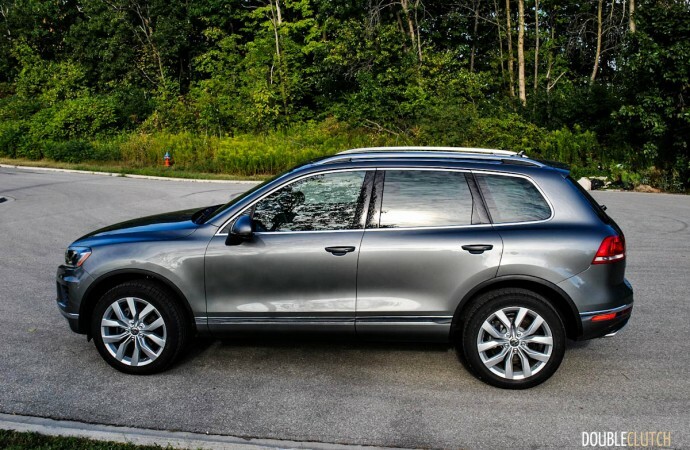 After spending a few days with the Touareg I realized that one of the reasons I liked it so much was because it represents my perfect daily driver. 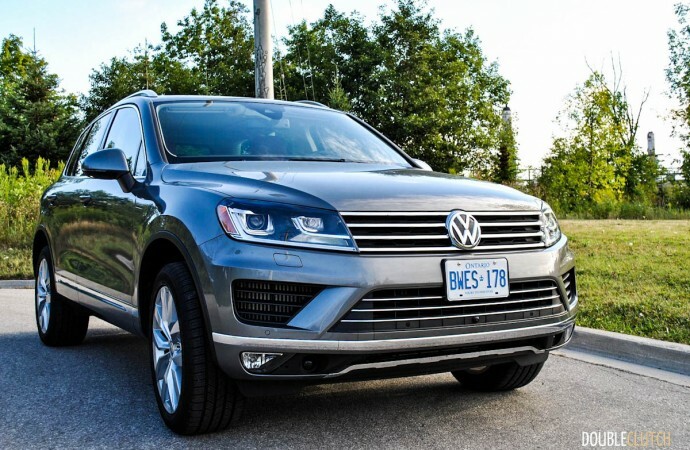 It’s extremely comfortable and efficient for my long commutes and frequent road trips; it’s capable enough to blast through those winter storms, has plenty of cargo space for furniture and home reno supplies, and it’ll pull a trailer loaded with one of the projects cars without breaking a sweat. Not only will it do all that, it’ll do it with style, elegance and a certain charm that only German finishings and a subtle diesel growl can deliver. 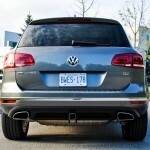 The Touareg TDI is easily my favorite Volkswagen and likely my favorite SUV in the premium mid-size segment.